Since the 40s and 50s, acrylic fibres have provided an alternative to natural fibres and made cheap and value yarns accessible to everyone who knits, crochets or works with yarn. While natural fibres, such as wool or alpaca, are still very much sought after and natural fibres undoubtedly produce some beautiful yarns, these qualities and textures are being recreated by man-made fibres and turned into extremely affordable yarns that are now more popular than ever before. Is acrylic yarn better than natural yarn? There are advantages and disadvantages to natural and man made materials, but just because low cost or budget yarns are inexpensive, it certainly doesn’t mean they are lacking in any quality. Natural fibres can sometimes illicit allergic or irritated reactions, while acrylic yarn is generally hypoallergenic (especially good for babies). Acrylic is lovely and warm, as well as being lightweight and washable. It is also extremely colour-fast and won’t shrink when wet; which makes it a great choice when knitting or crocheting for children, as anything can be washed over and over again. Manmade yarns can be fluffy, soft, and smooth, and treated in various ways to give the same appearance as cotton, fleece, lace, fur and more. Acrylic, and other synthetic fibres, are so versatile that they can be used as ‘acrylic wool’ and replace natural yarns and fibres for nearly all knitting and crochet projects. If you are a beginner, and just learning to knit or crochet, using acrylic yarns is a really cost-effective way to get started and find your favourites. 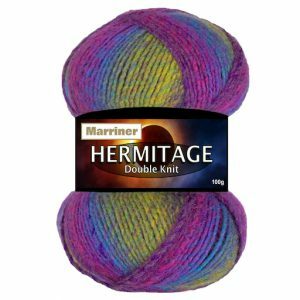 We know that so many knitter and crocheters are generous with their favourite craft and acrylic yarns therefore offer a really affordable option for charity and donation projects. Technology and production processes have leaped forward over the years, and the quality of the acrylic being produced is largely of an incredibly high standard. However, there will always be some manmade yarns of a lower quality that are not of the same top quality as Marriner’s soft acrylic that is used throughout our ranges. 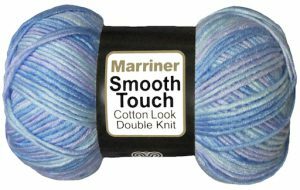 Marriner Yarns offers a wide range of yarns that are mostly exclusively acrylic. We feel that it is extremely important to always offer our customers the biggest choice we can, so everything they need is in one place, without the need to go hunting high and low for the perfect yarn. It is equally important that we always offer permanently low prices, so our customers are positive they are getting the best value – and without the need to wait around for any special sales or discounts. For us, this means that inexpensive and permanent bargain yarns will always be the way forward to provide everything our customers need; various weights, textures, and a beautiful variety of colours.